Lithium-ion battery technology is leading the zero-emission transportation industry. But you ignore the hydrogen fuel cell market at your own peril. 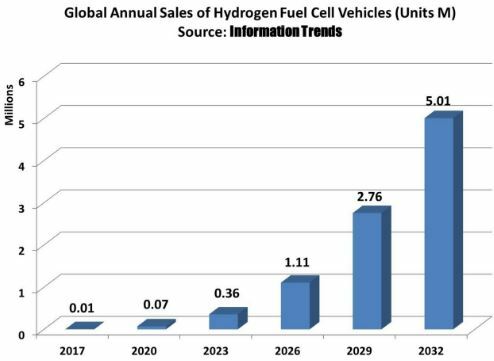 That's because hydrogen fuel cell sales could easily DOUBLE... then TRIPLE... then grow MANY more times over. The Hydrogen Council forecasts that by 2050, hydrogen will power more than 400 million passenger cars worldwide and up to 20 million trucks and 5 million buses. It expects hydrogen technologies to provide 18% of the world's total energy needs by that time, with the annual sales generated from the hydrogen fuel cell market reaching $2.5 trillion while creating 30 million jobs globally. That's quite a move for the market from here. But it's not an impossible one. According to the U.S. DOE, as of February 2019, there were only 6,558 hydrogen fuel cell vehicles in America. That's virtually nothing. But there are pretty good reasons for low sales number today — and good reasons to expect sales to increase many times over. First, it's important to remember that hydrogen fuel cell vehicles are not available in every area. It's very unlikely that you personally live near a dealer that sells a hydrogen fuel cell car. You could buy one, of course, but you'd most likely have to ship it to your house. And then there's a serious lack of infrastructure. As of March 2019, there are only 39 hydrogen refueling stations in the U.S., 35 of which are in California. Both of these factors play a major role in low sales right now. However, it's also very important to remember that hydrogen fuel cell technology is still developing. 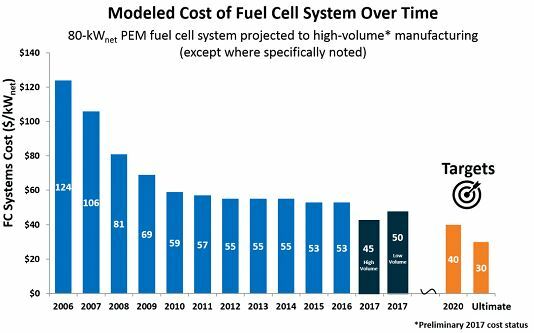 The cost of producing hydrogen fuel cells has dropped significantly over the past several years. And forecasts show further declines, but costs are still quite high. That makes retail prices for hydrogen fuel cell vehicles higher than their lithium-ion battery-electric counterparts. Toyota just recently began a promotion to sell its hydrogen fuel cell Mirai for just $50,000 — and that's with a $20,000 government subsidy. Tesla's Model X currently starts over $80,000. But that's its luxury model. Tesla's Model 3, which is comparable to the Mirai in luxury, starts around $35,000. So that's another thing holding sales back. But aside from production and consumer costs, hydrogen fuel cells don't really have a lot of serious support from many major automakers... right now at least. See, the science behind the case for hydrogen fuel cells is hard to argue against. The energy density of hydrogen is far higher than any lithium-ion battery, making for faster refueling and longer range. But in terms of overall efficiency, lithium-ion battery-electric is a bit better. And that has a lot to do with hydrogen production. Even though hydrogen is the most common element in the universe, it's usually bonded with something else... like oxygen to make water. And producing hydrogen for fuel is very energy intensive and expensive, as is storing it. This results in high costs at the hydrogen pump for consumers. YouTube channel Real Engineering found it costs between $10 and $12 to recharge a Tesla Model 3. With that, they got a range of 500 km (310 miles) for a fuel efficiency of about $0.020 to $0.024 per km. Comparatively, they filled up a Toyota Mirai for $85 and were able to drive 480 km (300 miles) for a fuel efficiency of $0.171 per km. So for the consumer, a lithium-ion battery electric vehicle makes a lot more sense... but again, right now. Hydrogen fuel cell technology is still developing — I really can't stress that enough. Lithium-ion battery-electric vehicle technology and sales didn't take off overnight, either. The U.S. Bureau of Economic Analysis reports that there were only 4,736 electric vehicles sold in the U.S. between 2008 and 2010. Last year there were over 360,000 EV sales in America. So can hydrogen fuels cell vehicles sales in America double to 13,000? Can they triple to 19,500? Sure... eventually, when costs of technology and fuel come down and infrastructure is built. But it's important to be an investor now because all that's happening now! With costs coming down over the years, hydrogen technology could be on the brink of a major breakout. So it would be foolish not to have at least some exposure to the technology. My colleague Keith Kohl is putting the final touches on a brand new hydrogen research report, where he dives deep into today's hottest and most profitable hydrogen fuel cell stocks. This report is expected be released to Energy and Capital subscribers very soon. So you must be on the lookout for that.